Minister of State for Textiles Ajay Tamta on Monday said that the silk sector has witnessed steady growth in recent years. The estimated cumulative annual growth rate of Silk sector is 6.40% based on the progress of silk sector during the last five years, the minister said in a written reply in the Rajya Sabha. He said, the estimated cumulative annual growth rate of Silk sector is 6.40% based on the progress of silk sector during the last five years. 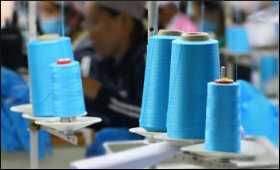 Tamta said, the Government of India has approved a project-based strategy for the North East Region under an umbrella scheme North East Region Textile Promotion Scheme (NERTPS)to boost the Silk sector in the region. Under the scheme, among various projects of Textile sector, sericulture projects have been approved under two broad categories - Integrated Sericulture Development Project (ISDP) and Intensive Bivoltine Sericulture Development Project (IBSDP). The MoS Textiles informed that these two projects aim at holistic development of sericulture in all its spheres from plantation development to production of fabrics with value addition at every stage of production chain. These projects are intended to establish sericulture as viable commercial activity by creating necessary infrastructure and imparting skills to the locals for silkworm rearing and allied activities in silk production value chain. He said, 24 sericulture projects have been approved covering Mulberry, Eri and Muga sectors in all States of the region at the total cost of Rs.819.19 crore with Government of India share of Rs.690.01 crore for implementation from 2014-15 to 2018-19. The Minister further said that the projects are expected to contribute additional production of 2285 MT raw silk during the project period and 1100 MT silk per annum involving 46094 families, which will generate employment to about 2.30 lakh persons. Till February 2018 the Government of India has released Rs.549.38 crore to North East States, against its share of Rs.690.01 crore. Balance amount of Rs.140.63 crore is earmarked for the remaining period of 2017-18 and 2018-19.